After reading VNs for over 2 years now and coming here again and again to either read some walkthorughs or to get ideas for new VNs to read I decided to create an acount, something I usually never do. But I did so in this case because I know that the VN genre will continue to fascinate me for a long time to come and it is fun to discuss VN related things. As my name may indicate I am not a native English speaker so please be lenient with me if I use overly complicated or weird expressions from time to time. Also, as you may see from my vndb profile, I read a lot of different VNs, I am not stuck with just one kind of VNs. A good story is the most important thing for me, although I also like romance and good heroines to chase. Mind you, I even read an otome VN although I am male and might do so again, if the story is good. And I will conclude this post with a real newbie question: How can I change my profile pic? I mean the one on the left side of the posts - the one which is currently just the letter 'A' in my case? Help is very much appreciated! Welcome to Fuwanovel! I'm sure you won't regret making an account in the end. I means, why would anybody regret doing that? There's nothing to fear from in our lovely community. Nothing at all. In your profile page, there should be a small icon in the down left corner of your profile photo (next to your nickname). Clicking it will give you the option to upload an image. Thank you for the welcome I have read quite a few topics so far and I am really surprised about the quality of the discussions going on. Hardly any flaming or offending and lots of good arguments. Looks very promising so far and is also the reason why I joined. And thank you a lot for pointing me to that little icon in the profile. I am not sure I would have ever found it otherwise, but as you can see to the left you were able to solve my problem. Yay! Welcome, glad you joined us. It's great that you are thoroughly interested in VN's. They are perhaps the most immersive genre, because they can have art, voices, music, text, while being able to span 30+ hours. So much room for variety. I remember when I first started reading I got hooked pretty quickly too. Looking at your list, I've only read Tsukihime and G-senjou no Maou. Fatal Twelve looks interesting though, I have it on my desktop. I'm sure you'll be able to find the discussion you are looking for. Welcome to Fuwanovel, and don't worry much about your English here (It's fine enough to me). Feel free to ask.some recommendations here if you need it, and I hope that you'll have a good time in here. PS - Sorry for the belated greeting here. 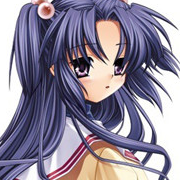 Thread creator has eccentric girl Kotomi as his avatar. Respect! Also (I didn't look at many VNDB profiles so far) I found it interesting that you can rate VNs not just in whole numbers? And one question out of curiosity: Why do you not rate all your finished VNs? Were they too bad to rate? There are two reasons I don't have a score for a VN. First are VN's which I played a long time ago. I used to have ratings for them, but I removed them because my rating criteria changed over the years (would have to review them). Otherwise, I leave the score blank if I don't know how to judge the VN, or it's way different from my tastes. Yup, I have these tools you mentioned (ITH and Translation Aggregator) ready to go. With these I was even able to get halfway through Dame na Koi and understand roughly what it was about (that was right when I started learning Japanese). But then I decided to first get a lot more knowledge about the Japanese language before continuing, so I stalled it. I am not sure though if I will continue with Dame na Koi as it will probably soon be released in English (or has it been released already?) and if I take on a Japanese VN I would rather prefer one that has not yet been translated.